It is a beautiful Spring day here in Tasmania. And I am at work in the store. Sigh. 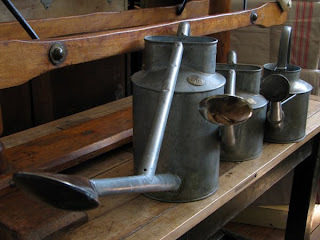 But as I am photographing items for our website I feel bubbles of excitement about gardening, mostly vegetable gardening. Mostly because I am photographing in my favourite room, the garden room. 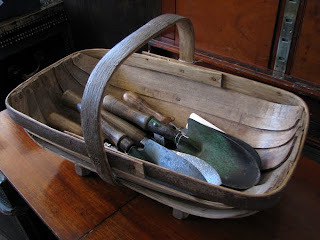 I love old garden tools (the are made better), trugs (very useful for gathering the harvest), pots (just cute) and old watering cans (they spray better). 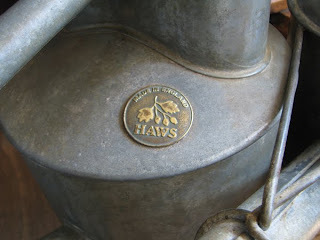 I am tempted to buy one of our English Haw's watering cans to keep my French one at home company. Haw's cans are really well made and have a great shape. Plus I love the brass spraying rose and maker's label that each can has. I am also tempted with these French garden edging tiles for some of my more permanent vegetable beds with artichokes, rhubarb etc). 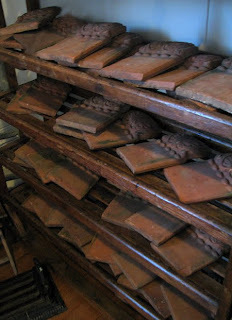 But we have just had some other unusual French garden tiles come into the store, so now I can't decide which tiles I want! Both types are beautiful. 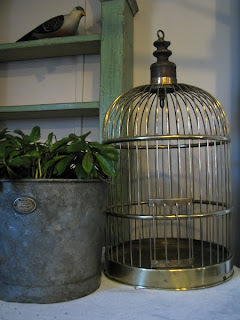 Does anyone else have a thing for old garden objects? 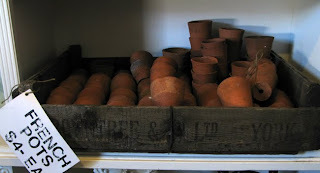 I too love old gardening objects, I am slowly converting my garage into a garden room.I absolutely love those tiles. 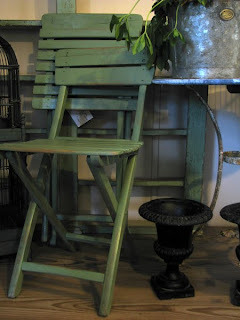 I love the green chair and the little pots are so cute. I seem to have a thing for old garden objects. My file of favourite garden images seems to contain as many pictures of watering cans and Hunter wellingtons as there are pictures of actual plants. A garden room would be glorious!